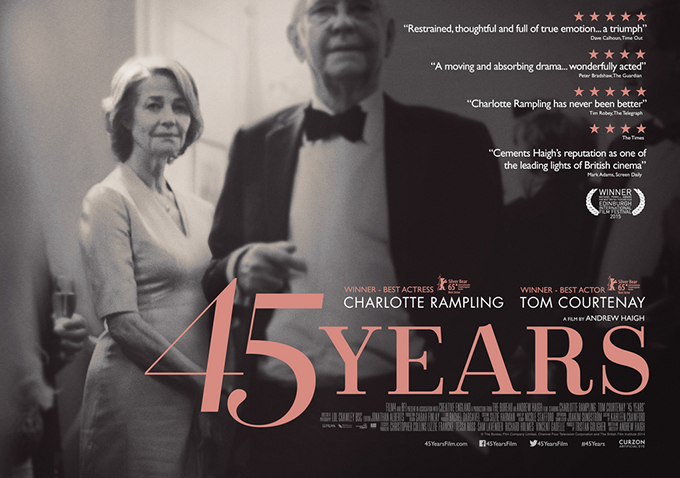 45 Years moves at a deliberately slow pace, necessary in order to let the film’s opening revelation fester within the household and within the central relationship of the story. That central relationship is between Geoff and Kate Mercer, played with nuance and poise by Tom Courtenay and Charlotte Rampling, respectively. The aforementioned opening revelation comes from a letter Geoff receives, one informing him that his ex-girlfriend Katya’s preserved body has been found in the Swiss Alps. It’s a revelation that occurs around the time of the couple’s 45th anniversary, and the two events coincide at just the right moment, dredging up wounds and memories from the past and slowly dividing the supposedly happy couple. The past haunts and hangs over every scene, and it’s like a horror film told through the lens of real human drama. However, the film does rely quite a bit on contemplative shots and repetitive images in order to convey a story probably more suited to a short film. I get the point of Haigh’s technique and I hate using ‘slow’ as a criticism for a film, but the execution isn’t quite as smooth; as good as the two actors are, this one doesn’t remain consistently compelling to me until the phenomenal final ten minutes. Nevertheless, the two key scenes at the end feature Rampling and Courtenay at their absolute best, and the use of “Smoke Gets In Your Eyes” is central to one of the most beautifully devastating scenes of the year. Like the review.. I wouldn’t have given it such a high grade. It was a C+ at best for me. Now here was my discussion with some people who were at the theatre also, I just thought when they showed the g/f preggers that it seemed to give the vibe that he had pushed her off the glacier because he didn’t want kids. i.e., they kept pressing that point throughout also. And that it would lead up to that. As it was..no. But while I found the film a bit slow, Rampling’s performance was sublime. 😀 Since your know where Laemmle is now, go see Mustang. It’s fantastic! That definitely is an interesting discussion to have! Definitely understand why there was expectation it would lead up to that.